Annotation: Number of pages 68, number of parts in appendix 8, number of bibliographic sources 36. Keywords: yoga, Yoga-Meditation, chakras, nadis, Kundalini, stress, lactic acid, urea in blood, meditation. The aim of this thesis was to investigate the influence of Yoga-Meditation on human organism, on its ability to resist in stress situations. This work is an attempt for application of the method, which by its simple procedures and zero financial requirements shows the wide range of its possibilities to influence the physical and psychical balance of the people. 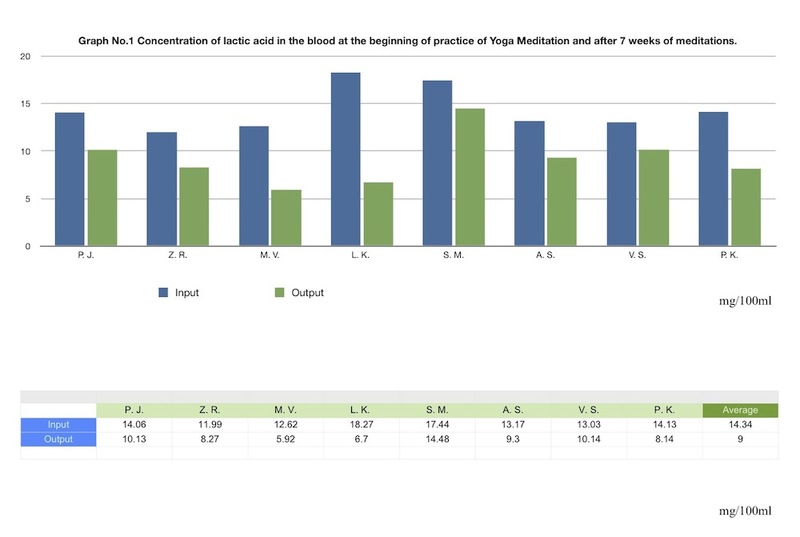 It shows the change of amount of some substances in the blood of tested individuals after 7 weeks of Yoga-Meditation comparing to the values immediately after starting with Yoga-Meditation. The introduction and the theoretical part are enriched with the stories from the field of Zen-buddhism, aikido, etc., which make the text interesting. The theoretical part gives the short overview of main concepts of Yoga, particular chakras and channels. 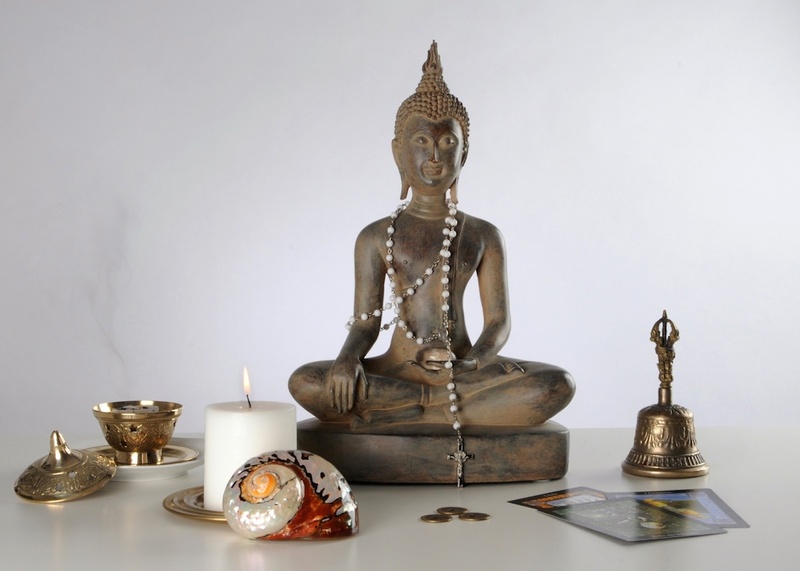 The characteristics of negative influences on particular chakras from the point of view of Yoga Meditation, the ways of their correction, overview of various illnesses and the ways of their curing by meditations, results of medical researches from the field of Yoga-Meditation and its influence on human organism are presented. In this work I was trying to investigate the influence of Yoga Meditation meditation on the following blood components: lactic acid, cholesterol, glucose, kreatinin, calcium (Ca) and magnesium (Mg). For my research I found 10 students - volunteers (8 men and 2 women, all of them active sportsmen). None of them practiced any yoga before, nor any meditations, any technics of bio feed-back, or any other psychic influencing methods. All of them come from the comparable social-economic class, and they were from 22 to 25 years old (average age 23). Six times in a week, in the evening, the group was performing Yoga Meditation during 20 to 30 minutes. If someone could not join the collective meditation, he was meditating alone, according to the instructions. During this time students did not change their way of living and alimentation. The experiment was being performed since the beginning till the end of the summer term for the students of the fifth year of study. This implies that the stress at school was either growing (students of the fifth year - finishing of the thesis, end of the term) or it was remaining at the same level (the students of the other years of study). As far as the training loading and the forms of training are concerned, they were not changed during this seven weeks, as the students had promised me before. The blood samples for analysis were taken early in the morning, immediately after awakening, with empty stomach. Nurses were taking it directly at the students' residence, in the rooms of students. Blood samples for each test were taken twice: three days after starting with yoga-meditation and after seven weeks of meditation. It could not be performed before the meditations started, because the students wanted to try the meditation at first and the to decide if they were willing to join the experiment. Two people could not be tested for the level of cholesterol, glucose, kreatinin, Ca and Mg because of their absence. Another two students were not tested for the level of lactic acid in blood because of the technical problems (one of them collapsed during the taking of the blood, another one's sample of blood was deteriorated). Blood analysis for the determination of the level of lactic acid was performed at the National Institute of Pharmaceutical Products Control, Kvetná Street, Bratislava. Blood samples taken for the determination of the level of cholesterol, glucose, urea, kreatinin, Ca and Mg were analysed in the Biochemical Laboratory of Derer's Hospital, Kramáre, Bratislava. Analysis were performed according to the standards. Technically it was not possible to test more than 10 persons (high price of the tests). I supposed that Yoga Meditation would act by several mechanisms and that the results could be visible as early as after 7 weeks. There is one difficulty for scientific description: Yoga Meditation is the matter of inside of the human being, it is the thoughtless state experienced after Kundalini awakening. Her awakening and ascent depends on the desire. This energy represents the desire of the man for something eternal and the desire can not be measured. This was the reason why the group was at first meditating for few days and just after this I started my experiment with the ones who were interested. If I wanted to have good results, they had to understand that meditation was not important for my work but for themselves. I was supposing that the level of lactic acid measured in the morning at the same conditions shows the better functioning, state and detoxication function of liver and kidneys. The average value of lactic acid changed from 14,339 to 9,145 mg/100 ml. At the level of importance p=0,01, this decrease of lactic acid is statistically important. This means that on 99% it was not a coincidence (the couple T-test for average value, from the program Excel, Microsoft was used for testing). The amount of produced lactic acid can show the intensity of anaerobe processes and production of energy. The lactic acid easily oxidate in the heart muscle, so its excess can show not only physical stress but the pathological changes of the heart as well. From physiologic point of view, elevated level of lactic acid in the muscles causes after some time the muscular fever, so for organism it is harmful. Glucose is the most important sacharide in the blood. It is used as easily transportable and usable form of energy. Kreatin, kreatinin and urea are important indicators for observing of intensity of the stress and process of regeneration. Excess of urea causes headaches, apathy, muscular weakness and tireness. The level of kreatinin is the indicator of intensity of muscular activity. Calcium (Ca) is important for the bones, teeth, gristles. Lack of it causes muscular cramps and osteoporosis. Excessive income of Ca causes its sedimentation in the skeleton and creation of pathological tumours. Lack of Magnesium (Mg) and excess of Ca causes increase of irritability. Excess of Mg can cause anaesthesia. Why, after starting Yoga Meditation, the level of lactic acid in blood decreases? According to Pitts, important increase of the concentration of lactic acid in blood occurs during the stress (its high concentration can cause anxiety symptoms). Average amount of urea in blood has decreased (from 5,400 to 5,049 mmol/l) but with very low statistical importance (the couple T - test). 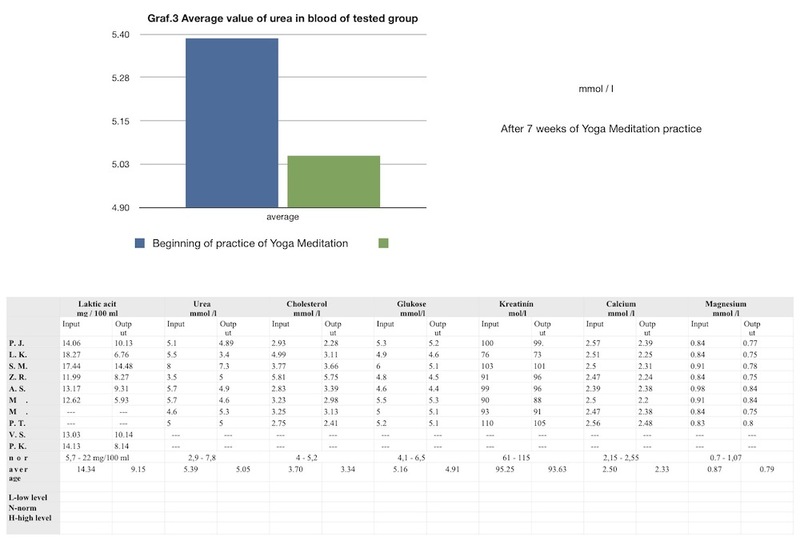 The level of Ca was changed to normal values in the blood of respondents, who had its level too high before starting Yoga Meditation. For one respondent the high level of cholesterol measured at the beginning of experiment decreased, but the normal value was still not reached. The low level of cholesterol of the other respondents remained at the low level. As there were significant and evident positive changes in the concentration of lactic acid, cholesterol, glucose, kreatinin, urea and mineral substances in the blood of tested persons, we can conclude that meditations had showed positive influence on the functions of the organs, detoxicating and synthetic functions of the liver and kidneys. After meditation, organism can fight better with tiredness, regenerate itself, the healing and cleansing processes can act more effectively. Results show positive influence of Yoga Meditation meditation on physical and psychical state of human beings. The research should be repeated with bigger number of respondents, more frequent measurements and during longer period. I hope that these measurements will be an impulse for the further investigation of this topic. According to these results, meditation could find its important role in the process of regeneration and psychical preparation of sportsmen. After the presentation, this diploma theses was highly appreciated by the jury and it got the best mark. As majority of the jury expressed their desire to attempt Yoga-Meditation, the presentation was concluded with meditation. Do you want to change something in your life and you don´t know how? Do you have not enough courage, power or self-will? "But above all pursue your kingdom and righteousness, and all other things will be given to you." Surrender your future to the Lord. Trust Him, and He will act on your behalf. Only the one who finds himself is no more alone. You are not only this body, mind and feelings. You are the spirit. When you find this spirit 'yourself' and God, you will find peace, infinity and joy. As the farmer waters his field, as the stone cutter polishes the stone, as the carpenter axes the wood, so the wise man forms his spirit. Peace is the master of chaos.